Week 1 of the 2018 NFL preseason gave is a small view into what should be a tremendous regular year around the league. Multiple young quarterbacks performed at a high clip during their rookie debuts, reigning Heisman winner Baker Mayfield included. Unfortunately, there were also some major injuries around the league. That includes star Washington Redskins rookie Derrius Guice. On the brighter side, JuJu Smith-Schuster continued his excellence in his sophomore debut while Andrew Luck made a tremendous return from injury. These are among the top takeaways from Week 1 of the 2018 NFL preseason. 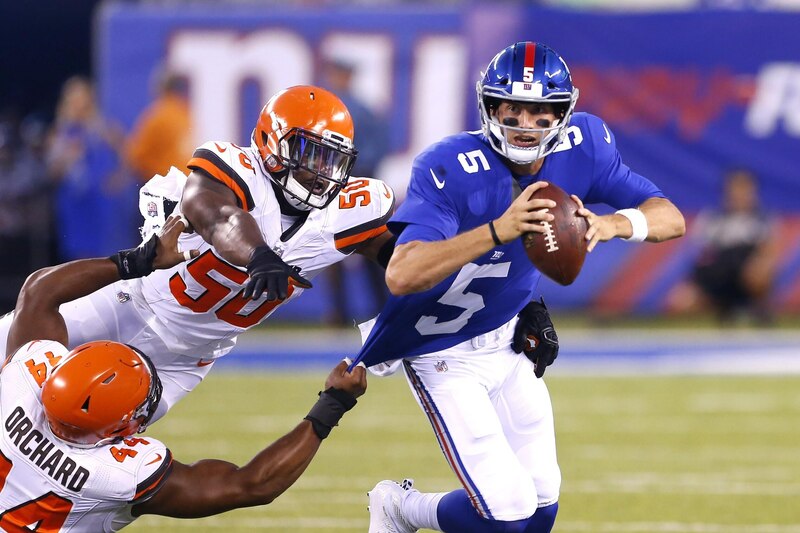 It didn’t take the reigning Heisman winner long to make his impact known in his Cleveland Browns debut against the New York Giants Thursday evening. 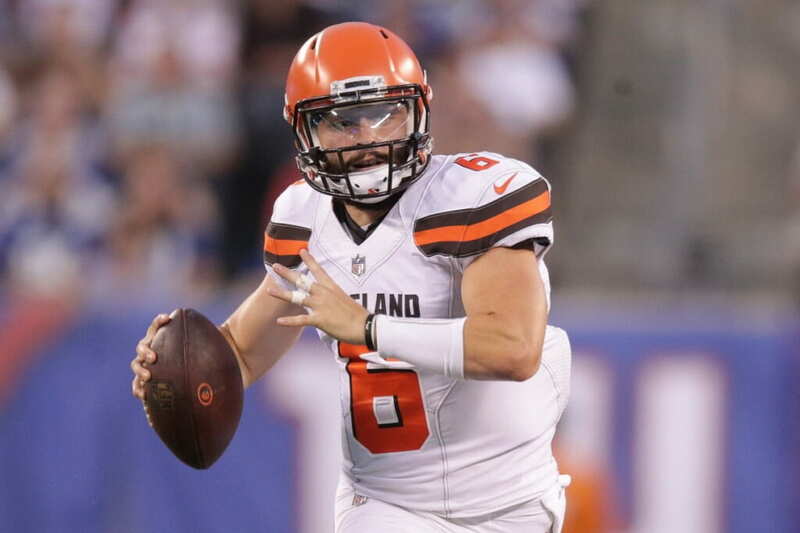 Mayfield led the Browns on two touchdown-scoring drives, each one culminating in a passing score from the quarterback (watch here and here). It wasn’t just the flashy plays that stood out for Mayfield after he replaced presumed starter Tyrod Taylor under center. Having completed 11-of-20 passes for 212 yards, the stats were there. But it was all about Mayfield’s command of Hue Jackson’s offense and pinpoint accuracy that should have fans in Cleveland excited about a quarterback for the first time since Johnny “false hope” Manziel’s rookie season. It could also lead to a surprise quarterback competition through the final three games of the preseason. Nathan Peterman and A.J. McCarron combined to complete 16-of-20 passes for 235 yards and this touchdown to Kelvin Benjamin in the first half of Thursday night’s game against the Carolina Panthers. They scored 17 points during that span, accumulating 270 total yards of offense. Not a bad day at the shop. Unfortunately, Buffalo’s offense came to a screeching halt with this rookie under center in the second half. It put up just six points, which included a garbage-time scoring drive in the last minute of the game. During that span, the Bills tallied 169 yards of offense with Allen himself completing just 9-of-19 passes and being responsible for this one hilarious blooper. Needless to say, it looks like the starting competition in Western New York is between Peterman and McCarron. Second-year quarterback Davis Webb entered the preseason with lofty expectations. The Giants had been talking the CAL product up throughout the entire offseason. Maybe, he could actually be the heir-apparent to Eli Manning under center. That was about as premature as this one scribe sliding into Carrie Underwood’s direct messages. Webb was absolutely horrible in his preseason debut, showing himself unable to hit the broad end of any receiver’s back side. He completed just 9-of-22 passes for 70 yards in extensive action. It’s now readily apparent that New York might have to look at the veteran free agent market for a backup to Manning. Webb isn’t going to cut it. And while impressive in his limited action, rookie mid-round pick Kyle Lauletta is just too raw to be relied on in the regular season. Colin Kaepernick, anyone? For a veteran of Ingram’s ilk to see seven rush attempts in a preseason opener, something has to be up. Given that the Pro Bowler is suspended for the first four games of the regular year, maybe New Orleans is simply trying to get him some summer work. But that’s a narrative the organization would be smart to throw out there as a way to increase Ingram’s trade value. What we do know is that the Saints were planning on second-year back Alvin Kamara handling primary ball-carrier duties prior to Ingram’s suspension being announced. We also know that the team has been open to trading the former Heisman winner. By showcasing him Thursday night against the Jaguars, it seems apparent that New Orleans is intent on trading the veteran. It’s certainly something to watch over the next few weeks. Already suspended for the first three games of the regular season, Winston’s off-field conduct in Arizona back in 2016 remains under investigation. It’s not yet known how the situation is going to resolve itself. This has led to speculation that the distractions might just be too much for the immature former No. 1 pick to handle — potentially giving the starting job to Ryan Fitzpatrick for the entire 2018 season. If Winston’s preseason debut was any indication, these concerns were overblown. He led Tampa Bay to 10 points on three full drives before a final shot at scoring was interrupted by halftime. 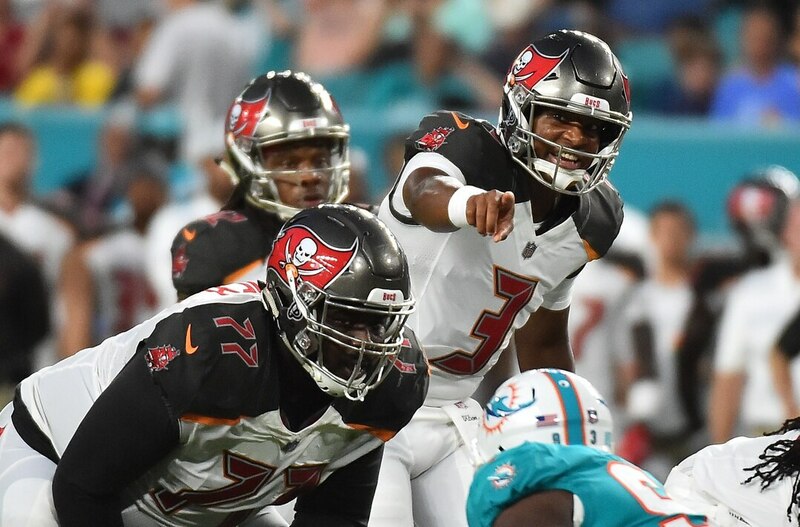 During that span, Winston looked darn accurate and comfortable in Dirk Koetter’s offensive system. All said, he completed 11-of-13 passes for 102 yards without a single mistake. Not a bad day at the shop for the embattled young signal caller. Regardless of the outcome of Friday’s home date against the Detroit Lions, it was great to see Jon Gruden back where he belongs — in Oakland. For the first time since an ugly divorce ended his initial tenure with the Raiders back in 2001, Gruden was manning the sideline at the Oakland Coliseum. Sure it might be short-lived with the franchise moving to Vegas in 2020, but that didn’t make the reunion any less significant. Of less importance, Oakland came out on top over the Lions. Veteran Marshawn Lynch looked spry, taking the ball 60 yards to the house on a play that was ultimately called back on a hold. All said, it was a festive environment for a coach in Gruden that’s looking to change the culture within the organization. It didn’t take this rookie No. 2 overall pick more than one play in his NFL debut to make a major statement. On the Giants’ very first offensive play against Cleveland Thursday evening, Barkley displayed the brilliance that made him an all-world talent at Penn State. He took the hand off from Eli Manning, exploded through the line and reversed course both inside and outside before breaking it for 39 yards. The play itself was what we saw over and over again at Happy Valley (watch here). Sure Barkley didn’t do much with his three other attempts in limited action. That means little in the grand scheme of things. Rather, it was that one game-breaking play that will soon define Barkley throughout his rookie campaign. Pittsburgh must have known it had a steal on its hands after selecting this USC product towards the back end of Round 2 in last year’s NFL Draft. Smith-Schuster flashed big time with the Trojans and was seemingly worth a first-round pick. It didn’t happen. And in turn, he put up a brilliant rookie season. When all was said and done, the 6-foot-1 wide receiver caught 58 passes for 917 yards and seven touchdowns. He also hauled in 73.4 percent of the passes thrown in his direction. 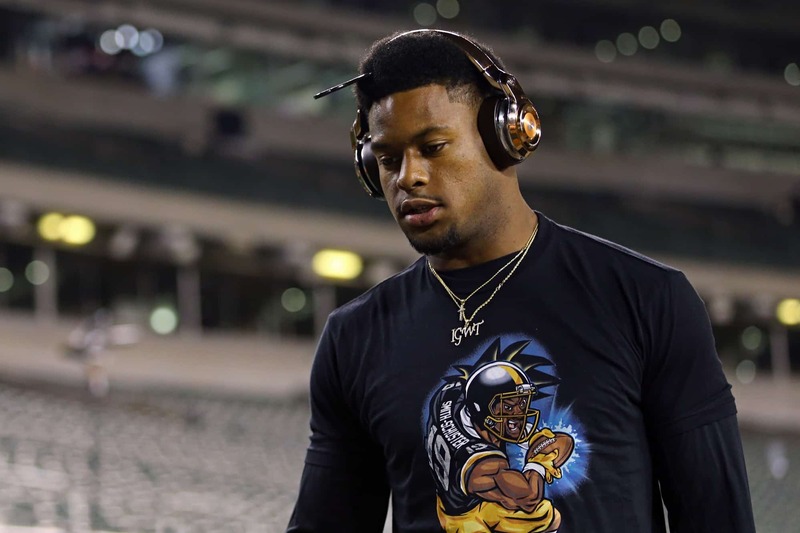 Like clockwork, JuJu was up to his old tricks in Pittsburgh’s preseason opener against Philadelphia on Thursday. It included this 71-yard touchdown catch from Landry Jones over Eagles corner Rasul Douglas (watch here). It’s these types of game-changing plays that should complement Antonio Brown over the next several seasons, starting with what will likely be a breakout performance in 2018. Even if Luck had not performed well in his preseason opener against Seattle Thursday night, it would have still been nice to see him on the field in live-game action for the first time since Week 17 of the 2016 campaign. Alas, Luck didn’t just play — he performed extremely well. The former No. 1 pick completed 6-of-9 passes for 64 yards en route to leading Indianapolis to scores on both of his possessions. All said, the Colts racked up 103 yards on 21 plays with Luck on the field. Having dealt with so many setbacks following shoulder surgery back in January of 2017, it certainly looks like Luck is rounding into pre-injury form. That’s great news for NFL fans the world over. Sitting the second-year quarterback for the Hall of Fame Game made sense. 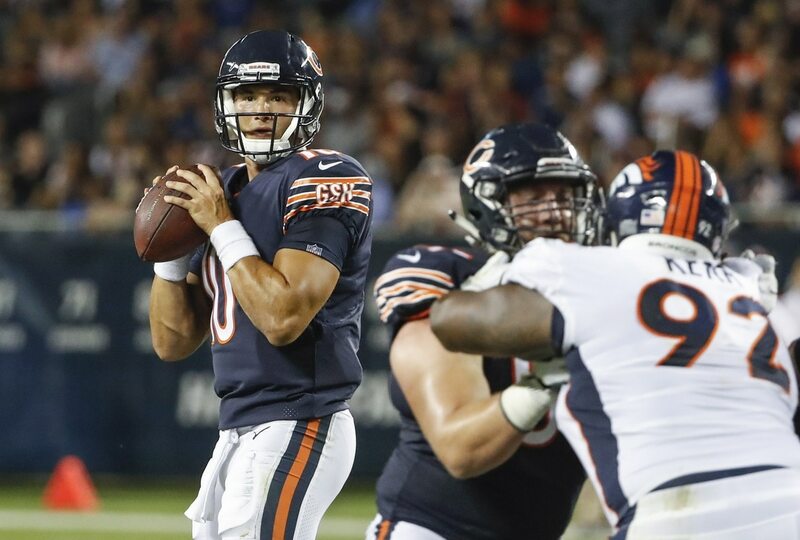 Sure rookie head coach Matt Nagy wants to see how Trubisky performs in his offense, but five preseason games is a bit too much. Unfortunately for the former No. 2 pick and his team, Chicago’s second preseason game Thursday night against Cincinnati showed us nothing of real substance. Trubisky completed 2-of-4 passes for four yards in two possessions. Chicago was forced to punt each time, leading many to wonder what the plan might be moving forward. We’ll get a better understanding this coming week against the Denver Broncos. The Derrius Guice injury really hit his Washington Redskins hard. Having worked his tail off throughout the summer and training camp, most expected the rookie second-round pick to enter the regular year as Washington’s primary ball carrier. Unfortunately, Guice suffered a torn ACL in his preseason debut and will miss the remainder of the 2018 campaign. It’s some horrible luck. We can pretty much say the same thing for Indianapolis Colts rookie sixth-round pick, wide receiver Deon Cain. The Clemson product also looked darn good during summer camp, only to go down with a blown ACL in his preseason debut. This is the harsh reality of an NFL where we’re seeing way too many knee injuries of this ilk. 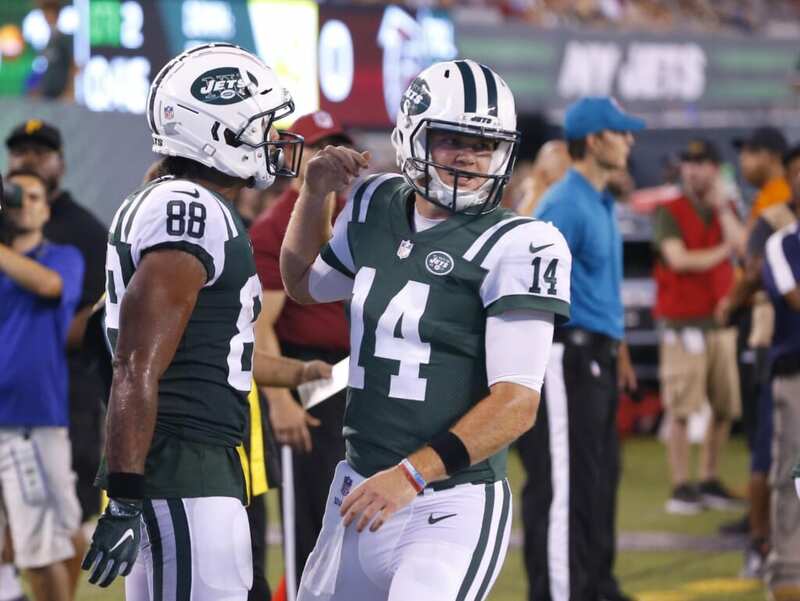 The third quarterback off the bench in the New York Jets’ preseason opener, Darnold made a heck of a first impression in front of the home crowd Friday night. After being forced to punt on his first possession, the rookie from USC led the Jets on a 10-play, 64 yard scoring drive, culminating in this touchdown pass to Charles Johnson (watch here). The Jets didn’t score on any of New York’s final five possessions, but the team was in run-first mode while leading Atlanta 17-0. It was, however, that one drive that showed us just how good Darnold can be. He had control of the offense, consistently went through his progressions and displayed pointpoint accuracy. That’s all we can ask for in a preseason debut. Cousins wasted absolutely no time showing the Minnesota Vikings exactly what he brings to the table. He completed all four of his passes for 42 yards on the opening possession against Denver, culminating in a touchdown pass to Stefon Diggs. That came after the two connected on a beautiful 28-yard pass. All said, Minnesota went 75 yards on eight plays to open the game. This is what the Vikings envisioned they had in Cousins after signing him to a record-breaking contract in March. 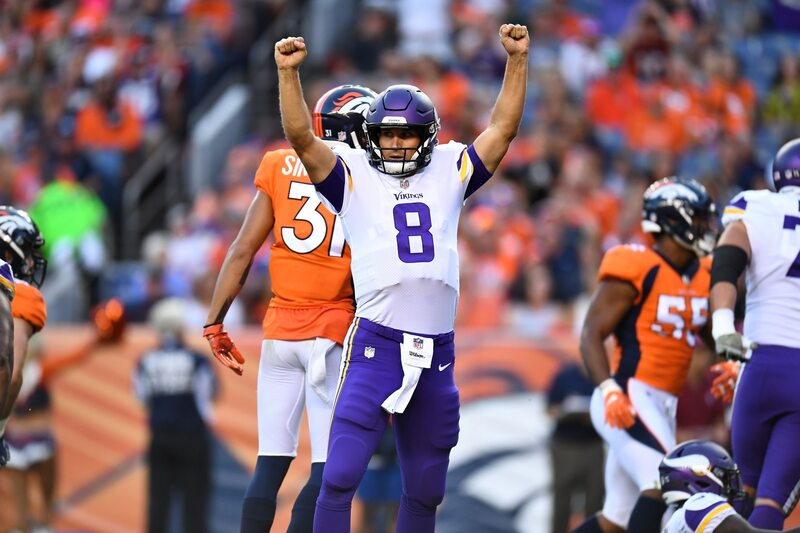 And while one preseason game matters little, he vastly outplayed former Vikings starter Case Keenum. That’s just icing on the cake right there.